Game description: Tokyo-23 is a land in turmoil. Each of the 23 districts has its own leader hoping to unify Tokyo-23 under one rule. Some do so for peace and justice, while some do so for their own personal gain. The Red Lance Corps of Minato Area are a team of schoolgirl warriors led by a charismatic young leader, whom they simply call "Master". Together, they must fight to unite Tokyo-23, but obviously that is easier said than done. 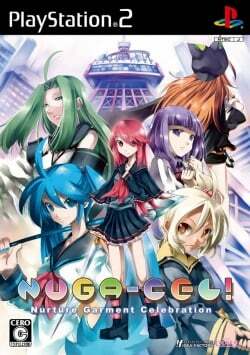 NUGA-CEL! is a light-hearted simulation RPG set in a fantasy version of modern-day Tokyo. The player, as the unseen Master, must assemble a team of female fighters, dress them up in super-powered cosplay outfits, and lead them into battle to unify all of Tokyo-23. The game is divided into days, during which the player can manage their territories and team members, shop for and create new outfits, and either enter a dungeon or attack a neighboring territories. The available territories are often dictated by the story progression, and there are also various scenarios centering on the different characters in the player's team. The defining aspect of the game is its cosplay system. In-game battles are turn-based, up to 3-vs-3. Each character can be assigned an outfit, which each give them different skills and abilities, not to mention appearance. However, as characters take damage, so do their clothes, which will eventually be destroyed leaving them vulnerable. It is necessary to switch and repair outfits to keep characters in fighting shape. Outside of battle, the player can purchase items and outfits at shops, and there is also an extensive crafting system where new outfits and items can be produced. This page was last edited on 15 April 2019, at 11:56.